Combine a sidescroller like Mario with Gradius and you get this! 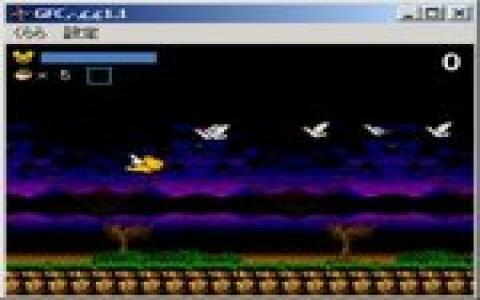 GF Captor Kurara is a combination of two formulas of sidescrolling games; on one hand the sidescrolling platformer that is Super Mario with shoot em ups with ships, like in Gradius and you get the combination of gameplay that is offered by this game. As you'll find out, GF Captor Kurara is not as polished as any of these games, but it's playable, in both of these hypostases, which will offer it a truly well produced build. So, overall, GF Captor Kurara is a cute, well looking, graphically, game, but nevertheless, it's not the kind of game that you'd want to play when you want something harder, as well as sharply produced. Nope, GF Captor Kurara is not that, but it's fun enough, especially when you've had a good share of it. The levels are cool though, especially the sidescrolling platforming ones, with a dark, lonely build, as in Metroid. The shooter, horizontal shooter is less well produced, but fun enough, though. Still, worth looking into, when you want a blend of sidescroller ideas.